Today was an entire day with absolutely nothing on the schedule. I love it when that happens. 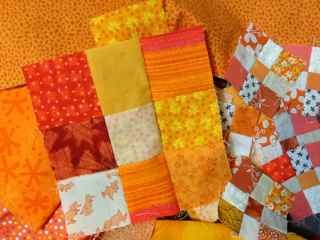 It is the last day of the orange month as well, meaning I really need to finish off the last little bit of hand stitching on the DJ blocks. 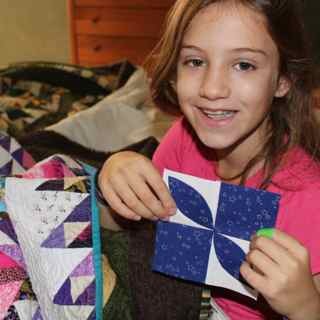 I got most of the 4 triangles done during the drive to camping last weekend, now we are settling down as a family to watch the Lorax and I will stitch a bit more. I spent the afternoon doing the prep work for the green blocks I hope to finish next month. Two were so simple that they got finished right away and another one was prepped for hand sewing. I've been working on spring cleaning this week as well. The tile in the master bath is impressively clean and three drawers in the kitchen are nicely organized and tidy. What else? Oh yes, the countertop in the laundry room where everything seems to collect is empty. Nobody in my family has noticed any of my projects, but I feel better for having done something productive over the holiday. 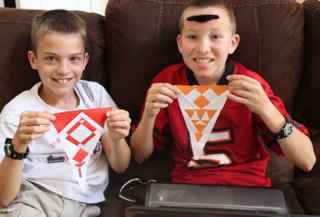 I JUST finished the last two orange triangles. ALL the orange Dear Janes are now done, except for a bit of hand sewing of applique bits. Ryan and his friend Troy were my volunteer block holders. They have something going on with fake mustaches. The kids have all built a zipline in the back yard and have got most of the neighborhood over playing on it. They have just met a new family that moved into the neighborhood with an 11 and 9 year old girls and a 7 year old boy. They think its cool that we have SO many kids here. Oops, looks like they are off on an egg hunt. They are hiding them for one another in the back yard. I should probably go supervise. Orange has gone on for quite a while and I am not sad to see another color on the horizon. There is still the rest of the weekend though to clear out the last bits and bobs that remain. I have a few postage stamp blocks in the works ready to be finished up. After that I will cross the last orange Dear Janes off the list and call it a wrap. How about you? Fresh out of orange and ready for a fresh month? Use the linky below to share your orange progress. As much fun as vacation is, coming home again is always so much better. We were so lucky to have reserved a cabin for our camping trip or we would have been home much sooner. Flash flood and tornado warnings are a bit more than I am willing to subject the kids to in a tent. There was lots of good family time. Even though it turned a little bit chilly, hiking and fishing were still crowd pleasers and the kids were all brave enough to try out swimming in the springs. They weren't hot springs unfortunately. Best of all, spring break is only half over so there is plenty time to relax before heading back to school for the final stretch. I am way behind on blog reading and e-mail, but hope to work my way through it while watching a movie with the kids tonight. I did get a bit of sewing room time in today and spent it catching up on scrap cutting. Tackling one color at a time makes it seem less overwhelming somehow. 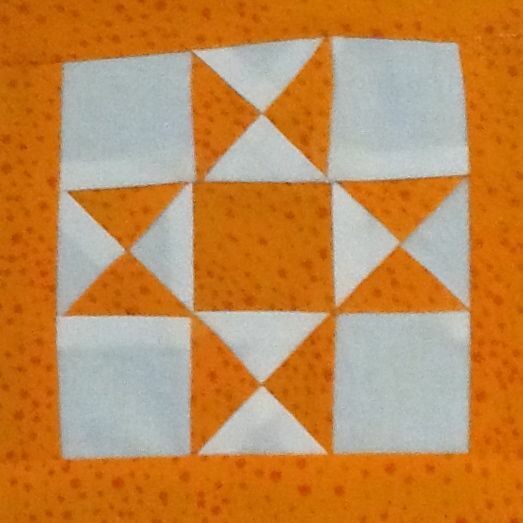 Today is another applique block. It is A3 and it has 9 pieces. Ryan was out playing flag football with kids from the neighborhood today. He was nice enough to hold the block for me before he headed off to bed though. 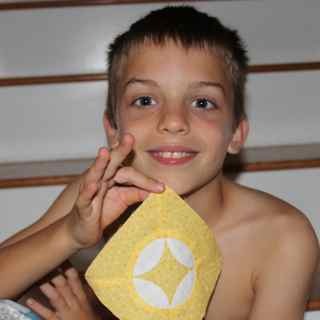 I have a stack of blocks that had the applique bits sewn on during car trips of days gone by. Now it is just a matter of sewing the bits together to finish off the blocks. This one is E10. Sydney was all snuggled under a pile of quilts to watch TV in Mom and Dad's room. A very special treat indeed. 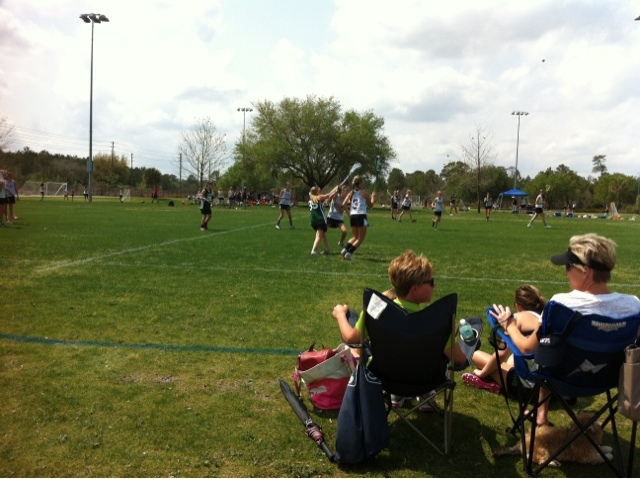 There are only three lacrosse leagues in our county which has meant that most of our games this year have been away. Today we are in Orlando for a double header before driving to our campsite for spring break. We have a cabin which is a first for us. It looks like a rainy weekend so a bit of shelter will be nice to have. 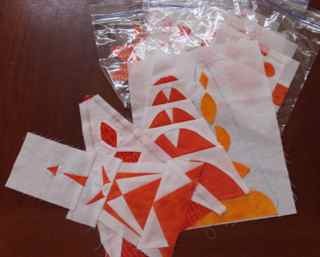 I got the hand work done on two orange triangles on the way here and finished another on the machine before we left. I will be happy to move on to the next rainbow color for Jane. ScrapHappy Saturday - Orange you glad its still orange? It seems like orange has been going on forever. Last weekend I sewed lots and lots on tiny nine patches. There is something very soothing and relaxing about the tiny little pieces. Another week has passed and nothing has been sewn since the weekend. 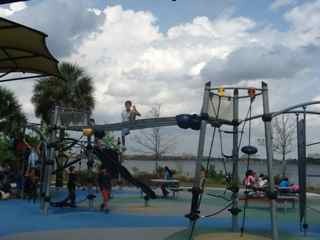 We are now officially on spring break though, so I am hoping for some quality machine time. Believe it or not, there is still another orange Saturday to go. Use the linky below to share your own orange creations. 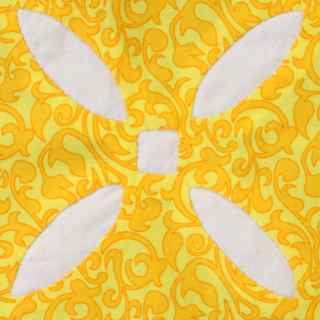 It is applique this week with C6. I tried fussy cutting this time. I wish I had cut the white part as a single circle so that the edges lined up better, but nonetheless It is another block crossed off the list. Another clever block with two four patches. The top one was rotated and reverse appliquéd onto the top of the other. Thanks again to Karen Kay Buckley for her perfect circles. 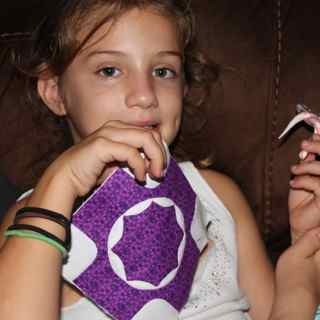 I am also a big fan of her applique scissors. 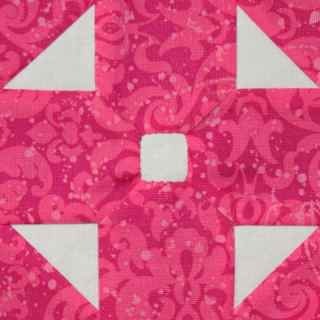 Who knew I was going to become such a big fan of applique blocks? Another week and not a stitch was sewn. 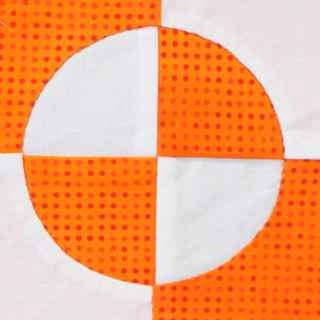 I have a few more giant orange nine patches that came out as leaders and enders last weekend. I was working on another Dear Jane on Sunday Evening and it is still sitting under the presser foot on the machine waiting patiently for the weekend to roll around again. Just one more week for us before spring break at school and the natives are getting restless! 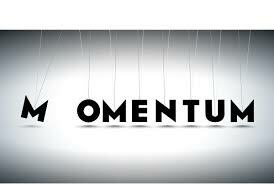 After spring break standardized testing season starts in full swing and it will be a race until the end. Speaking of races, I am determined to finish off the last of my orange Dear Jane's today. I think I can do it. Just a few triangles remain. How about you? Starting to see the bottom of the orange bin? Use the linky below to share your orange creations. 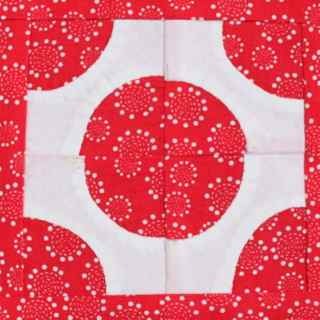 This week's block is called Wagon Wheel. 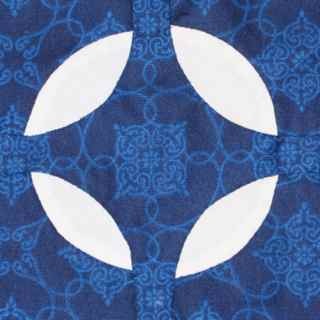 It has three layers of traditional and reverse applique. Sydney was my block holder tonight. I'm not sure where that dimple came from, but I do like the foot. 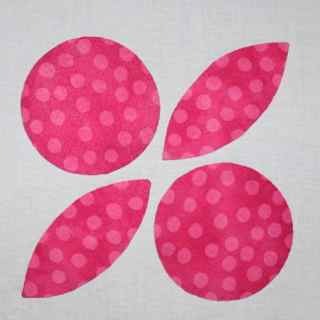 A7 was regular applique, but for some reason I decided to do both forward and reverse. The melons turned out slightly different sizes with the two methods, resulting in a slightly wonky seam allowance on one of the corners. I might try to fix it, or I might go with the Dear Jane moto, "finished is better than perfect". 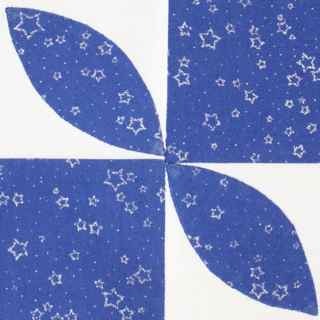 I tried English Paper piecing for this little Dear Jane block with all sorts of set in seams. It really was a nice relaxing way to get everything to lie flat and angle just the way it should. I think I'll get another one ready to stitch this way during the week. There are a few blocks that would work well with this method. There is a tutorial here for those Janiacs out there. I also paper pieced this little paw print block to use as a mug rug for a coworker who is having a rough time these days. Another teacher is organizing random acts of kindness for next week and this will be my contribution. 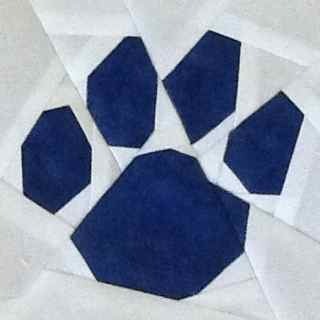 The wildcat paw is our school logo and I even have a school crested mug to put it into. 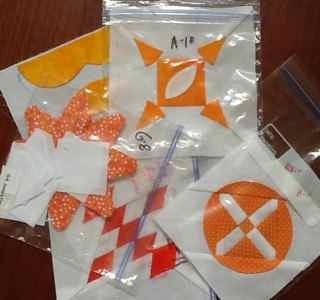 The pattern was free from paper panache. Kurt took all three of the kids out to play paintball this morning. I'm not much a fan of guns, so I stayed home to enjoy a bit of piece and quiet. They are back now all tired and dirty, but I think they had fun. I am getting close to being done with the orange Dear Jane's, I worked on triangles this morning. SO awkward! 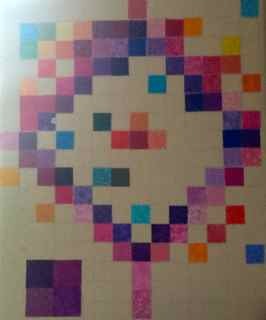 Still, after finishing off all the blocks, in a color, the triangles represent the home stretch. I am sure I'll be glad later that I didn't save them all for the end. Still plugging away on Orange Dear Janes. It has been chilly here lately, the perfect excuse to stay in and stitch a bit, but work has taken all of my energy this week. Hopefully this weekend will change all that. There were so many bright and shiny blocks last weekend that I am feeling inspired. 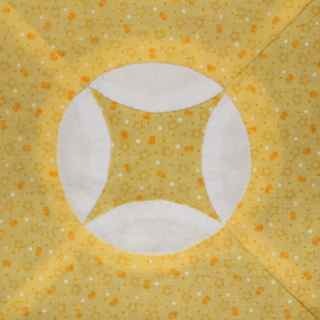 Have you had a chance to sew together a few bits of happy orange sunshine? Use the linky below to share your own orange progress so far. 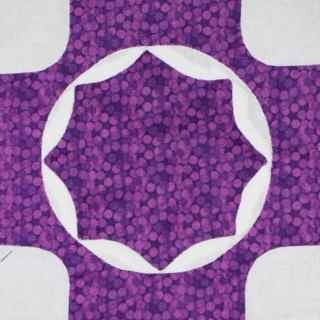 This week brings block B9 which seemed like it was going to take hand piecing with set in seams. 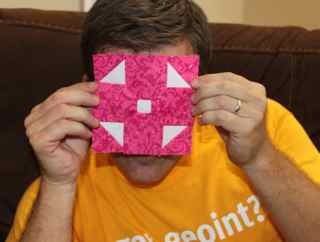 Instead I followed the directions at That Quilt. They worked out great. Kurt was my model again this week. He doesn't seem to take my quilt blocks very seriously. The applique bits were done quite a while ago for this one, all that remained was sewing the squares together and sashing them out a bit. The edges didn't quite end up even when I sewed the four patch together, so I ripped it out and tried again. It didn't end up any better. Then as I was ironing them, the iron left dark marks on the edges. So I washed it in the sink and tried again. Then as I ironed it again, the same thing happened! I guess I would have been better off letting it be the first time. 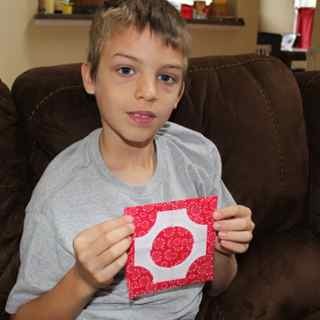 Ryan is my happy block holder today, he was nice enough to take a break from his video game to pose. Block C11 is crossed off the list. Next? Simple applique today. F13 was just two circles and two melons on a plain white background square. I am finding my Karen Kay Buckley perfect circle templates to be quite handy for making nice round circles. If only she made melons! Whenever working on Dear Jane blocks, there always seem to be quite a few that need a bit of applique. 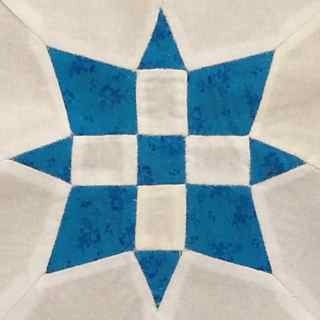 Though most of the true applique blocks got done off the bat, lots of them are pieced with melons or diamonds added onto the top. Those have all been save for a bit of slow stitching time on Sunday. The Dear Jane wall of progress is coming along nicely. The upper left hand corner is getting quite full. I even did an extra red block today so that it would fill in an empty space. It is so tempting to just fill in the rest of top row, but I do need to keep working on the orange. There are 8 triangles to worry about this month. I hope you are all taking some time to slow down and take a deep breath before the new week starts. 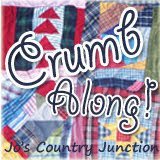 Kathy is hosting slow stitching Sunday, so be sure to go see what everyone else is working on this weekend. 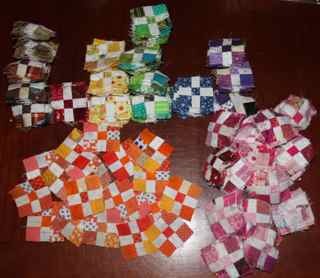 Look at the size difference between the nine patches made with 2 inch squares and the ones made with the one inch size. 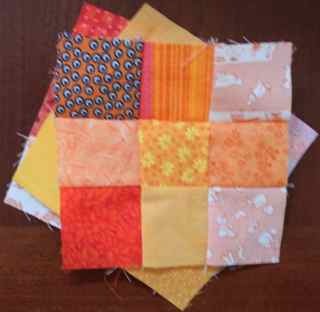 The larger blocks will be part of a Mai Tai quilt and the little ones will be either a Birthday Quilt or Omigosh. Some day of course, for now they are both long and slow works in progress. Anna has a Lacrosse game in Tampa today and I would like for us all to go and see it, but Kurt is pretty adamant that it wouldn't do the others much good to sit in the car for an entire day going back and forth. 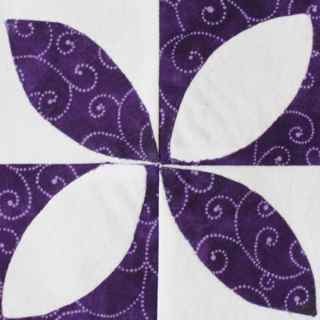 I must say I was tempted when I saw the mention of a quilt show on Bonnie's blog, but I'm not sure it would work out all that well. It wouldn't be bad to have a day at home for a change. How about you? Home sewing or out and about? Use the linky below to share your plans and progress as we begin a brand new month of orange. Sydney's Girl Scout Troop had thinking day last night. It is a chance for lots of different troops to get together and learn about other countries. 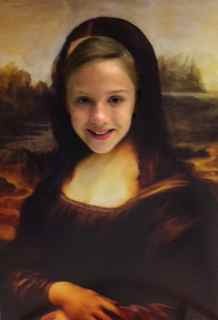 Her troop chose France, they sang Frere Jaques, built an Eiffel Tower and posed for pictures as Mona Lisa. It has been a busy week and the weekend doesn't look much better, but for now I am going to steal away and sew a bit. I have some orange plans underway and can't wait!